Chicken in White Wine with Morels, Thyme for Cooking gourmet main course. Coq au Vin, Chicken Braised in Red Wine, is a French Classic. Doing it in white wine, less so. I scoured my cook books looking for ideas. This was the end result. It will join the list of our favorites. Remove the skin to allow the wine to penetrate deeper, adding flavor.... and to reduce the fat in the finished dish. Pour the wine over the chicken, add the bouquet garni and marinate 2 - 3 hours in the fridge. Remove chicken from wine and drain well, reserving all wine. Heat 3 tsp oil in a heavy, deep pot over medium-high heat. Brown chicken on all sides, a few pieces at time, about 10 minutes. Return all chicken to pan and pour over all but 1 cup of reserved wine. Add nutmeg, bouquet garni and chicken base (if using). Cover, bring to a simmer, reduce heat and simmer for 45 minutes. Soak morels in reserved 1 cup of wine, plus enough water to cover if needed, for 30 minutes. In a medium nonstick skillet sauté shallots in 1 tsp oil until light brown. Add to chicken. Remove morels from wine, drain, reserving liquid, and add to chicken. Allow sand and grit to settle in the wine used to soak morels, then carefully add the soaking liquid, without the grit, to the chicken. Cover and simmer 30 minutes longer. Remove chicken from pan and place on a platter. 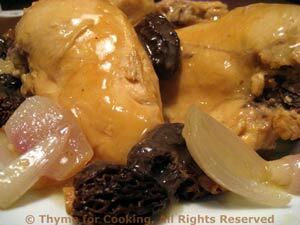 Arrange morels and shallots around the chicken, cover to keep it all warm. Bring sauce to a boil over medium heat. Dissolve cornstarch in water. Slowly add to sauce, stirring until thickened to desired consistency. You may not use it all. Spoon some sauce over the chicken, serve the rest on the side.